Blogger Magazine is a responsive Blogger Theme ideal for Magazine, Blogs, News-portal and personal-blog etc. Reading the name of this theme one can easily sense that this theme is designed for magazine style blogs. 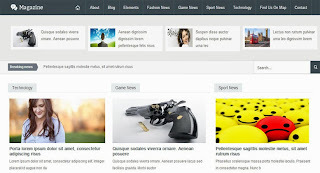 This theme was created from the inspiration of a wordpress theme same like this theme of ours. We have made this theme compatible for blogspot platform.